Fresh local winter fruit is essentially non-existent in our northern climate. Imports from California, Mexico, or South America prevent me from developing scurvy through these cold months until I can indulge in Fraser Valley blueberries and Okanagan cherries once again. At the Winter Farmers Market, the fresh fruit selection includes only stored apples but there are a variety from which to choose. My recent favourite has been the Ambrosia, a delicious eating apple, but they were unavailable and so a big bag of Honeycrisp came home instead. Unfortunately, these Honeycrisp were not so crisp and the picky apple eater in me refuses to eat a soft apple. 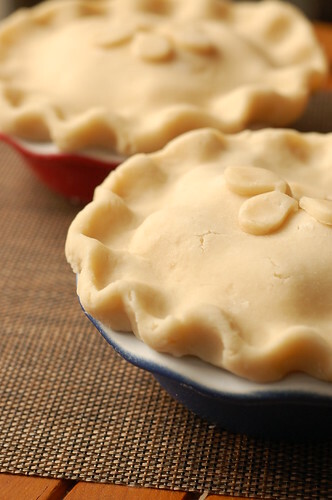 But what a good excuse to make apple pie instead! Funnily, I never had a home-made apple pie growing up until I made one myself in my late teens; however, I did consume my fair share of MacDonald's apple pie, those deep-fried golden bars ready to spill their molten apple innards which were replaced by the "baked" version in 1992. I remember them so well and with such disturbing fondness. Even the characteristic pillow box packaging makes me a little sentimental, thinking of the many times my sister and I would sit in the back seat of my mom's Volvo eating our MacDonald's apple pie while being shuttled between piano lessons and dance class. 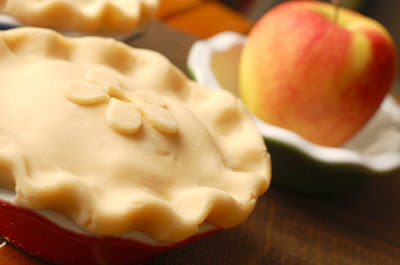 Meanwhile, these Honeycrisp apple pies were assembled in small 5.5" diameter pie plates. This relieves the unavoidable urge for Eric and me to gluttonously consume an entire 9" diameter pie as fast as possible since a freshly baked pie is always yummier than leftover pie, in my opinion. Only one small pie was baked and shared à la mode while the rest patiently await their turn in the freezer. It's all about portion control, right? Posted by Charmaine at 11:53 p.m.
February 4, 2009 at 4:54 p.m.
February 4, 2009 at 5:08 p.m.
Beautiful little pies! I have a couple of honey crisps that somehow have spent a couple of months of cold storage in my fridge. They still look nice...but I'm sure they would be too crisp either. I should put them to the same use! February 4, 2009 at 9:13 p.m.
February 5, 2009 at 8:55 a.m. I just visited your blog for the first time and I really enjoyed it! I have just started baking last year and I really enjoyed it a lot. 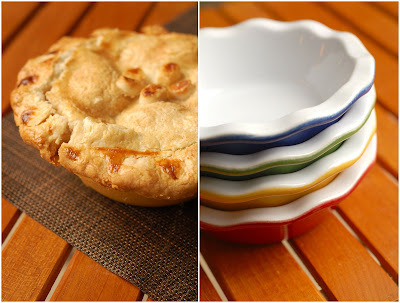 February 6, 2009 at 11:34 a.m.
Are your little pie dishes from Emile Henry? Their new collection, "Nougat" is to die for! All in Earthy tones. March 19, 2009 at 4:23 p.m.
March 19, 2009 at 7:39 p.m.